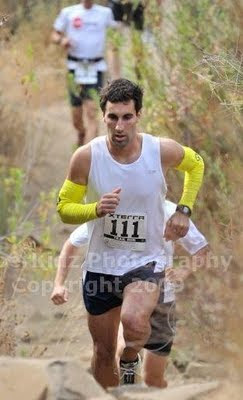 Last Saturday, I headed out to Ray Miller to help mark the course for a "comped" entry on Sunday. Initially I thought there was going to be a partner joining me for the loop to help carry the chalk, stakes, stapple gun, hammer, and chalk bottles, but it turned out I had the 18k loop to mark myself.. Which ended up taking two and a half hours to mark trying to run with 20lbs of gear and water. It was a bit more of a pre-race workout than I bargained for (as well as standing for 6 hours afterwards at the TTT sidewalk sale), but I got a 60$ entry for free so it wasn't bad pay at 20$ an hour. Sunday morning came, and my legs felt ok enough to race. I did a short warm-up and talked a bit with my buddies P-dubs and Danimal. The overcast sky kept things cool under 600ft. The race started, and I got out into the front to avoid tripping on the initial single track climb. For as young as I was relative to the field, I felt confident and accordingly ran relaxed in the front. The chase pack was litterally breathing down my neck for the first three miles, but I still kept my heart rate down and ran a consistent pace through the climb. After the first climb, the pack was about 10 guys, and after the second climb (which again is more visually difficult than physically) the pack was reduced to 3. 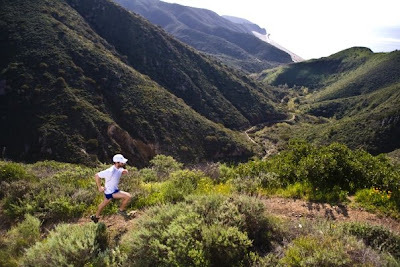 As we rounded the corner at the top of the second climb and began to run north parallel to the coast, Jonathan Toker and I began to leave the 3rd runner and began to open up our stride along the downhill sections towards the entrance to the valley. Though I don't have a picture for it, the cloud cannopy was beautiful on the day. Once you passed 600ft, you were right at eye level with the clouds running in the golden sun reflecting off the white cotton candy. I actually mentioned to Jonathan as we ran around a canyon that was filled with clouds that it looked like a bowl of vanilla ice cream... and he agreed it did. Coming into valley, the marathon training started to pay off. 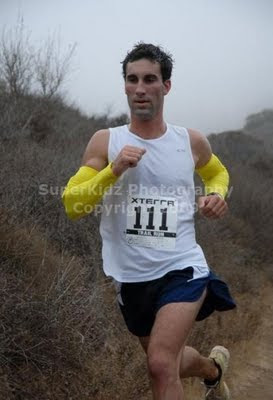 I was strong in the flats and gentle downhills, and eventually outpaced JT by mile 7. I had a few gulps of water and kept a steady pace onto the short Parker Mesa Overlook climb. I began to pass the 3rd and 4th 11k runners, and looked eagerly for the leaders to pull me into the finish for a better time, but I couldn't see the next runners anywhere on the trail. I looked back and still had a good minute on JT with 3 miles of downhill to go, and decided to let the day end without injury as I shut it down. I had the win, and gunning it for a faster time would just be an unecessary risk. I cruised into the bottom in 1:14:43 and felt ready to do a second loop, but elected to take it easy cooling down a bit and going for a dip in the ocean. The Long Beach Marathon in two weeks has a hill of 50ft, and nothing else for 26 miles. I'm still not sure how I feel about that as I'm definitely a bit stronger at climbing than the standard marathoner, but we'll see what happens. It's a little nerve racking to think of running 26.2 miles at 6:00 or below even though I haven't ran further than 20 miles in 2 weeks, but I think I'm ready for it. Nice run. Your intimate course knowledge from the day before must have helped! Congrats on the win. Thanks for the support! Being sick and so achey right now makes it hard to believe I ran so well 2 weeks ago..